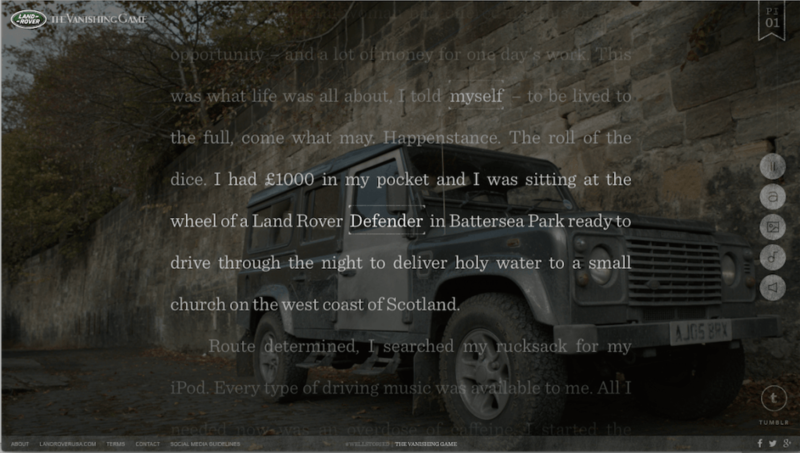 Land Rover’s recent debut of The Vanishing Game, a 17,000 word story by British novelist and screenwriter, William Boyd, takes the concept of brand storytelling to exciting new levels. The story, which describes a driving adventure from London to the southern tip of Skye in Scotland, is hosted on a dedicated Tumblr blog, but is also available across various tablets and iBook for free. Viewing on Tumblr is recommended for its robust storytelling experience. Moving graphics and still images help the reader to visualize the novel, while sounds like music and a voice over narrative in synch with the text overlay, all add an experiential layer to the novel that is completely different from that of a traditional eBook. Each of these elements can also be turned off, allowing the reader to customize to their preferences. Also unique is how the Land Rover vehicle itself was woven in. Instead of serving as the protagonist, the vehicle is more of a supporting character, transporting the character of Alec Dunbar to his final destination. It takes the majority of the first chapter to even mention the vehicle, let alone see a visual of it. There are a few lines of text here and there that feel slightly more promotional, but the overall effect feels much more natural than the average piece of sponsored brand content. Part of the reason why may be the partnership with respected novelist and screenwriter, William Boyd. According to Digiday, Land Rover viewed this project as a “true commission,” versus a typical product placement or sponsorship. Meaning, the author had free reign to create an original story, favoring the quality of the story over product placement. This initiative is also symbolic of Land Rover’s ongoing commitment to brand storytelling on Tumblr. From the rugged and romantic adventures chronicled in Land Rover USA’s Tumblr, The Journey, to the recent spotlight on consumer stories with its new #wellstoried Tumblr, the mix of brand and user-generated content is well-done. A big part of storytelling is inspiring feelings and moving your audience. The Vanishing Game does a fantastic job of this by paying close attention to the details, like sound, visuals and animations that compliment the story. While text or a well-placed visual can be moving, the harmony with which these elements come together is what takes the experience from good to great. 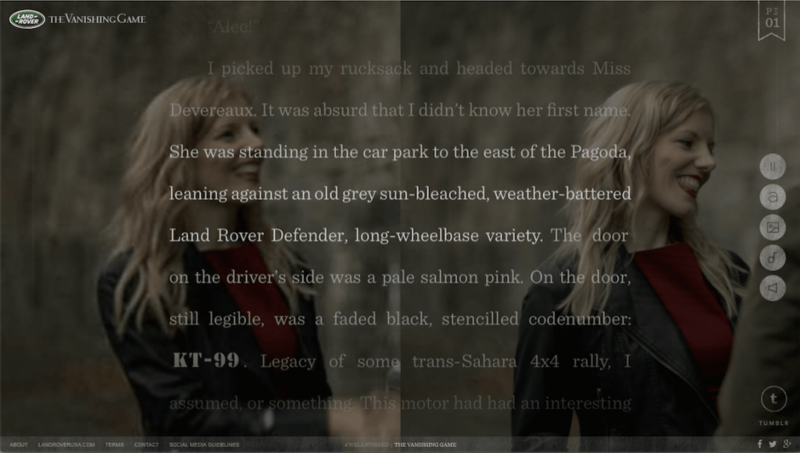 Although Tumblr is arguably the best way to experience The Vanishing Game, Land Rover was smart to think through who their target audience was and how/where they enjoy to read books. By adding Kindle, iBook, and more, the additional access points will open the book up to a much larger audience. Any time you partner with a specialized content producer or influencer, the images, video, or text they develop for you is a reflection of your brand. As a result, there’s a fine line companies walk between ensuring a 3rd party understands their brand and watering down the creative process. With The Vanishing Game, it was encouraging to read that Land Rover didn’t want to control the creative process. The key is to focus on selecting quality people to partner with that are naturally in line with your brand values.